February is the second month of the Gregorian calendar and third month of Winter’s rule. There are several places the name February may have come from. 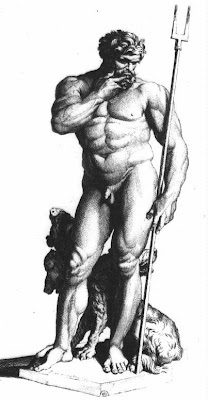 The God Februus, who was later identified with the Roman God Pluto is one possible source. More likely is the Roman Goddess Februa, the mother of Mars. As a Goddess of passion she also became know as Juno Februa and later St. Febronia, from febris the fever of love. Her orgiastic rites were said to be held on February 14th originally. Ovid wrote, “In ancient times, purgations had the name of Februa… the Grecians held that pure lustrations (proprietary offerings) could efface an impious deed to guilt of blood… ” However Februata was also the name of an aspect of Juno and is related etymologically to the words febrile and fever (as in spring fever). The Irish named this month Feabhra or an Gearran, the gelding or the horse. The horse was used to draw the plough, but Gearran also means ‘to cut’ and ‘Gearran’ can be used to describe the ‘cutting’ Spring winds. To the Anglo-Saxons, this was Solmonath, “sun month,” in honor of the gradual return of the light after the darkness of winter. According to Franking and Asatru traditions, this month is Horning, from horn, the turn of the year. Aquarius and Pisces share astrological power over February, with Pisces taking over around the 19th of February. As far as constellations go, we start with the sun in the constellation of Capricornus, and end with it in the constellation of Aquarius. Along with January, February was the last month to be added to the Roman calendar. This was originally a monthless and uncounted period of time. It was changed in 700 BC by Numa Pompilius in order to bring the calendar in line with the lunar year. Numa’s Februarius contained 29 days (with 30 in a leap year). It is alleged that later Augustus removed one day from February and added it to August (which was renamed from Sextilis to honor himself), so that Julius Ceasar’s July would not contain more days. Since the year originally began in March, after the monthless winter, February became the last month of the year. Because the Roman’s followed a lunar year, and had not counted the winter before, the Roman priests would occasionally insert an intercalary month, Mercendonius, after February to realign the year with the seasons and the lunar passages. It as important that the new year be aligned so that the celebrations fell at the proper times to match the seasons. Historical names for February include the Anglo-Saxon terms Solmoneth (mud month) and Kale-monath (named for cabbage) as well as Charlemagne’s designation Hornung. In old Japanese calendar, the month is called Kisaragi (如月, 絹更月 or 衣更月). It is sometimes also called Mumetsuki (梅見月) or Konometsuki (木目月). In Finnish, the month is called helmikuu, meaning “month of the pearl”. “February” is often pronounced without the first r, as “Febuary”, by many speakers. This is probably dissimilation, or an analogical change influenced by “January”.